GamesDesktop promises an unlimited access to online games; however, our researchers do not recommend installing this suspicious application from games-desktop.com. If you do, you will activate a desktop menu presenting links to various online games. Even though some of the offers presented may be harmless, there is always a risk of connecting to unreliable sites. Have you already downloaded some games using the service? You may have to delete them from your PC. Of course, the most important thing is to remove GamesDesktop. According to our researchers, GamesDesktop is a new variation of the infamous advertisement-supported program OneSoftPerDay and MyBestOffersToday. We believe that you should delete these applications from your operating system as well. In most cases, you will find the files of this software in a folder whose title will start with “gmsd.” These files are signed by Tuto4PC.com; however, this is not the only suspicious domain you will face. It has been discovered that the games downloaded via GamesDesktop may be sent from the suspicious server cdn.cloud4ads.com. Active security software may block downloads from this server. Have you already deleted GamesDesktop, but your operating system is still running in a disorderly manner? This is a problem that users who download GamesDesktop packaged with other software often face. The suspicious program may be installed with isearch.omiga-plus.com, Snap.do, FastPlayer, BoBrowser, and various other apps that all users should remove from their operating systems. Unfortunately, the removal of these threats may be much more complicated and difficult than the removal of the suspicious application itself. GamesDesktop displays offers via a pop-up window that appears from the Taskbar. The application presents links to different installers promoting online games. Needless to say, you have to be careful not to install unreliable software. Another reason why you must delete GamesDesktop is to stop the collection of the data related to your virtual activity. If other threats run alongside adware, we recommend installing automatic malware removal software to delete them instead of performing the manual removal. Open the Start menu from the Taskbar and click Control Panel. 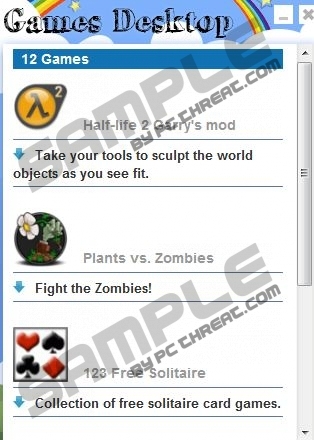 Double-click Add or Remove Programs and Remove GamesDesktop. Select Uninstall a program and find the undesirable one. Right-click and Uninstall the application you have chosen to delete. Quick & tested solution for GamesDesktop removal.